Martha, my bloggy friend who first informed us about Eyebrow Threading, gave me a tip that Benedetta skin care line was a little-known organic set of products for people who didn't want to look like they were entering or in their 40s. I contacted Benedetta and they sent me some teensy-weensy samples, insufficient for me to have an opinion on until I order a full set. Martha to the rescue. She has volunteered to share her experience with Benedetta. When Martha talks, I listen. Greetings, Dear All Thumbs Readers! 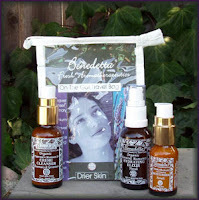 I am so excited to be a guest reviewer about the organic and aroma therapeutic skincare line, Benedetta that I have used for over two years. I was intrigued by the idea of an organic and aroma therapy based skin line after seeing Benedetta in a catalog, and I decided to try the travel set with the assortment of facial and body care products to see if it “agreed” with my skin. After three days, I was hooked on these products because of how my skin looks and feels. Benedetta’s skin care includes both body and facial care. For their facial care line, they have three types of cleansers and moisturizers including for dry, combination, and oily skin. I have oily skin but live in a very dry climate, so the Rosemary Verbenone cleanser and Rosemary Hydrating elixir for combination skin works well for me. The Cleanser is clay based and you can also use it as a clarifying mask. It smells incredible and leaves your skin velvety smooth. Plus it helps regulates breakouts. The Hydrating Elixir is moisturizing and is used after cleansing and can be spritzed on the face throughout the day right over makeup. The final facial product that I frequently use is their Control Cream which contains natural antiseptic properties with tree tea oil which does everything from heal acne to stop a bug bite itch. I also enjoy Benedetta’s body care products including their hand sanitizer and deodorant which don’t contain the petroleum and metals commonly used in these types of products. They smell wonderful and are very effective at keeping you feeling fresh and clean. I have not only had a great response from my skin with Benedetta, but their customer service has also been very helpful both over the phone and with their website. Thank you so much, Lori and Chicklet for allowing me to share my experience at All Thumbs. I really appreciate you both and all your commenters! Thanks, Martha, for saying this to my face. Thank you so much for this honor and for those super nice things you wrote, Wow. i am definitely checking into this.. not only do i believe martha... my middle name is benedette!! i was named for my great grandmother.. benedetta... i think its fate!!! !